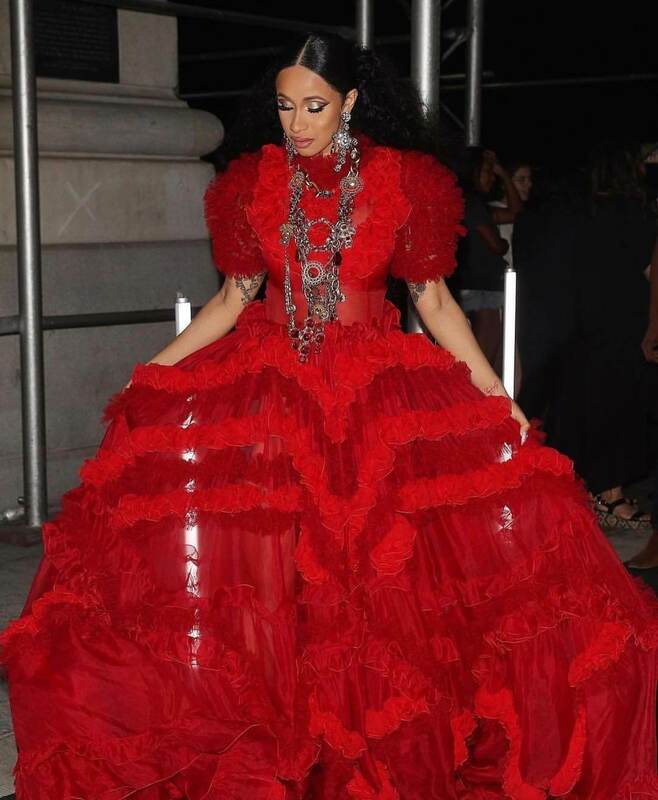 Rapper Cardi B is not a newbie to fashion. Since and even before her Cardiella moment at the 2017 Diamond Ball she has been putting her best fashion foot forward. She and her stylist Kollin Carter who has worked with names like Justine Skye, Sofia Richie, were an unstoppable pair this fashion month – from New York to Milan to Paris, every look was a LEWK! Cardi started fashion week with a bang. She looked elegant at the Tom Ford NYFW runway show wearing a black fitted gown by Tom Ford with a knee length slit that allowed her show off her Giuseppe Zanotti Sandals. She also paired her slightly understated look with Dylan Lex earrings. 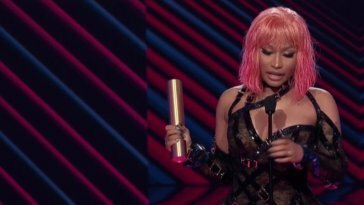 Cardi B’s most memorable moment during Fashion month was at the Harpers Bazaar’s Icon Party in New York where she had an altercation with fellow rapper Nicki Minaj and had to leave the event. She wore a red couture dress by Dolce and Gabbana, her now infamous red platform shoes with her hair pulled back in a sleek ponytail with a curly tail. We would have loved to see more picture of this outfit which was arguably her best. 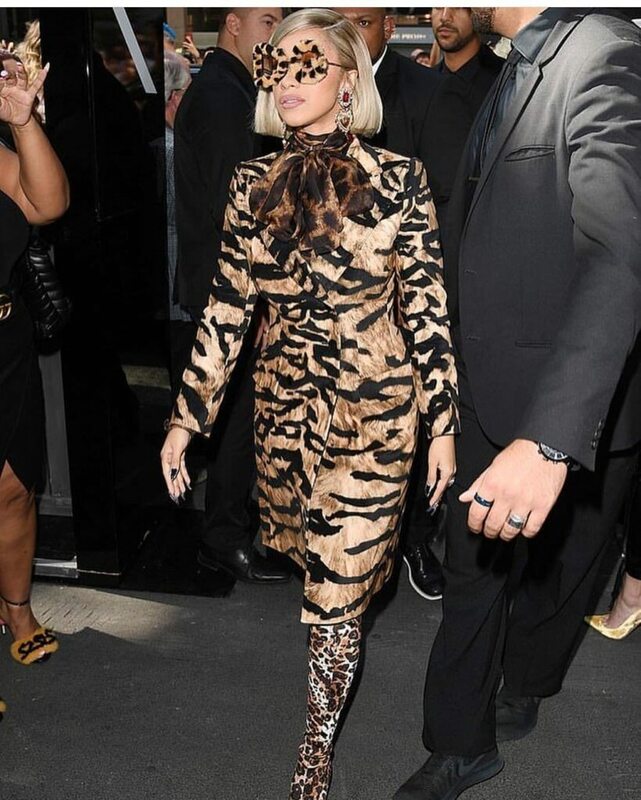 Cardi made her debut at Milan Fashion Week dressed in head to toe Dolce and Gabanna. She wore thigh high leopard boots with a coat and furry shades and a blonde Bob. Cardi B performed for the Dolce and Gabbana runway show wearing a pink floral suit with an embellished lapel and gold shoes. She paired the look with a long sleek blonde weave. She channeled her inner Slayonce in this blue patterned dress with a matching oversized fascinator by Michael Costello and black platform Elie Saab heels. For lingerie line Etam‘s Runway Show at the Paris Fashion Week, Cardi wore Christian Cowen lavender suit that screamed Couture! The suit jacket had heavy feather extension which paired with her lavender hairstyle made her look like an elegant flamingo (I know they are pink). Cardi wore a piece straight off Mugler‘s runway. Her biker short was one of the pieces the French designer showcased at the fashion show. She paired the fringed bike shorts which came with a corset with a simple backless black blazer, sleek pulled back hair do and black Louboutin pumps. She added Dylan Lex earrings for some extra glam. Next article Slick Woods’ Post Baby Body Is Amazing!!! 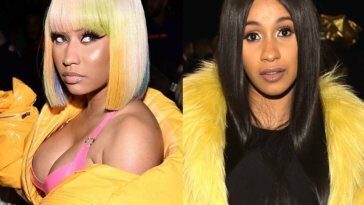 Nicki Minaj & Cardi B Squash Their Beef At #MetGala + They Both Looked Good AF! Slick Woods’ Post Baby Body Is Amazing!! !